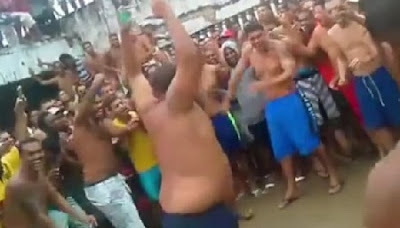 A fight between rival groups in a jail in northeastern Brazil killed 10 detainees and injured several Monday, officials said. The fight broke out during the morning in the Public Jail of Itapaje in Ceara state. Police and guards brought the situation under control, according to a statement from the Justice Department of Ceara. Several detainees who were injured in the fight were treated at a local hospital and then sent back to the jail. Three, however, were injured more seriously and were being sent to a hospital in another city. In response to the fight, authorities ordered the transfer 44 detainees to other facilities, a common practice to separate rival gang members. Officials also seized two guns, two knives, drugs and cellphones in searches following the unrest. The department has however declined to give more details.